Old taps may become difficult to turn on or off. 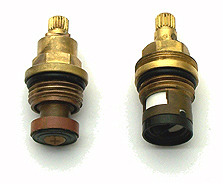 Or you may find not much water comes out.This can be because the valve is worn out or scaled up. Once you get the valve out inspect it. If it's got a lot of lime scale on it it might be worth trying to remove this with lime scale remover and finally grease it with silicon grease (available from plumbers merchants) if this doesn't help simply replace the valve (approx. £5). Tip Take the valve with you to the plumbers merchants to. They do tend to be standard sizes but what sometimes varies is the shaft top that connects to the tap. If that doesn't match then you'll have a problem fitting the tap top back onto the new valve.